Trailblazer, Andrew Parsons from Toyota is helping us create a range of exciting new apprenticeships. Some involve car construction, whilst others revolve around the mechanical ‘systems’ which underpin most of our lives on a daily basis. Often these systems operate behind the scenes, and may have little, or nothing to do with cars. Andrew - words like ‘mechatronics’ may not be familiar to our readers. Can you explain (in layman’s terms) about the kinds of things these apprentices will be trained to do? Many industries use ‘mechatronics’ (which is a combination of ‘Mechanics’, ‘Electronics’ and ‘Fluid Power’). You might not know what the word means, but without realising it, you are probably benefitting from mechatronics systems much of the time. For instance, if you order a washing machine online, this process will kick start a ‘Mechatronics system’ which will enable you to receive the product you want. Can you explain what you mean in more detail? Ok, so once you’ve placed your order for the washing machine, a mechanical process will be set in motion. Firstly, the correct washing machine in the retailer’s warehouse will be identified electronically. Then another machine will lift this washing machine off its rack, and place it on to a ‘computer controlled’ conveyor belt. After this, yet more machines will be involved in the process of wrapping the item and sending it out. Many of these processes are completely computer driven and do not involve the human hand. So how is this relevant to the apprenticeships standards you are overseeing? 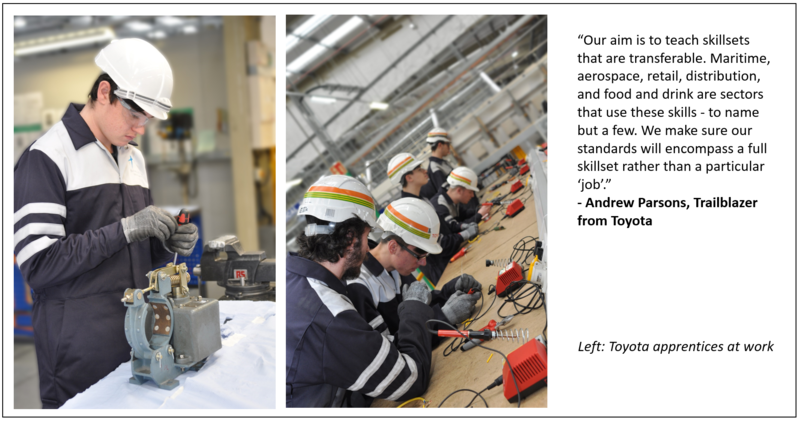 Our apprentices look after the equipment involved in these kinds of processes. They maintain the factories and tools needed to make the products, and those involved in distribution. Does this mean that the apprentices will acquire skills that can be used in other industries? Most definitely yes. Our aim is to teach skillsets that are transferable. Maritime, aerospace, retail, distribution, and food and drink are sectors that use these skills - to name but a few. We make sure our standards will encompass a full skillset rather than a particular ‘job’. And can you explain a bit about the ‘tool and die’ standard? The “Tool & Die” Standard is all about the ‘Pressing and Moulding’ processes involved in building a car. The apprentices will learn how to make a car bumper or other plastic parts, through using ‘injection moulding’ tooling. For the body of the car, the apprentices will learn how to maintain a variety of tooling, including the ‘presses’ which weigh 22 tonnes. These presses will cut and shape sheets of steel every 4 seconds at 4,000 tonnes of pressure, forming them into various panels of a car. So you can see this involves complex, heavy machinery, and it’s a huge responsibility, with various intricacies and bespoke requirements. That’s why each apprentice will take 3-4 years to get to the level required. Read the second part to this series where Andrew Parsons, Trailblazer from Toyota, talks about his involvement with apprenticeships and his own views and experiences as a Trailblazer. Hello Jenny,Really nice information,world rapidly going with Mechatronics.